Evergreen vines are problem solvers in the garden and should be used more extensively. They are infinitely useful for many purposes. Akebia quinata, fiveleaf akebia, Zones 4-8. 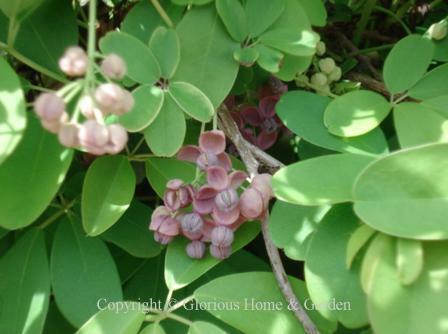 Fiveleaf akebia is only semi-evergreen except in the warmer zones or mild winters; still it is an attractive vine with bluish-green leaves and chocolate-scented purple flowers in spring. A vigorous vine, plant on a sturdy structure and prune to keep in check. Bignonia capreolata, crossvine, Zones 6-9. This semi-evergreen to evergreen vine is native to the southeastern U.S. and has reddish to orange-red fragrant trumpet-shaped flowers with yellow inside. In the wild, this vine can reach 50-70', but can be kept in bounds under cultivation. New cultivars are emerging such as 'Dragon Lady,' all red; and 'Tangerine Beauty,' all orange. Crossvine flowers best in full sun. Ficus pumila, climbing fig, Zone 7b-10. Ficus pumila, also known as Ficus repens, is a small-leaved woody vine related to the edible fig. With its fine texture, climbing fig makes an attractive covering to soften brick and other masonry surfaces. Gelsemium sempervirens, Carolina jessamine, Zone 6-9. This beautiful native evergreen vine is synonymous with the South and usually begins blooming in February, but I've spotted a few of its bright yellow fragrant flowers popping out in January in mild winters. Hedera canariensis, Algerian ivy, Zones 9-10. Algerian ivy, similar to English ivy but not as hardy, is popular ground cover vine for sea coasts in the warmer zones of the country. Hedera helix, English ivy, Zone 4-9. A very familiar ground cover that is sometimes the only solution for heavy shade. However, it can become rampant and invasive, and looks rather jungle-y to me if allowed to climb to the tops of trees. Kept in check, though it makes a very attractive ground cover. 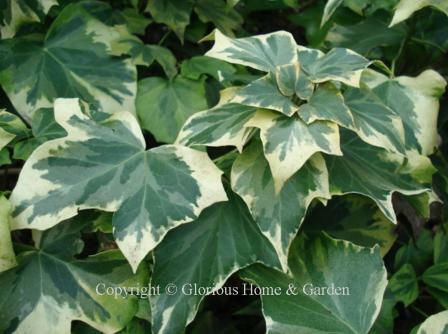 Some of the variegated cultivars are really beautiful, such as 'Arnoldsville' below. Hydrangea integrifolia, evergreen climbing hydrangea, Zones 8-9. Hydrangea vines are beautiful choices for walls, arbors or pergolas. H. integrifolia has flowers similar to the lacecap type of H. macrophylla. Hydrangea seemannii, Zones 8-10. Another evergreen hydrangea vine that also produces white lacecap type flower clusters in summer. Jasmines: Evergreen or semi-evergreen depending on location. Jasminum floridum, showy jasmine, Zones 8-10. 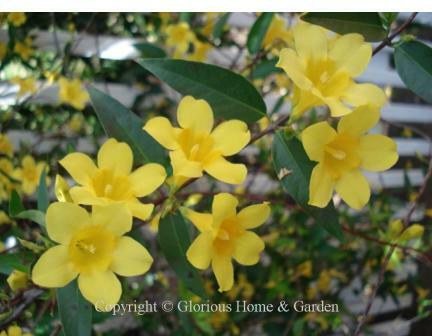 Jasminum humile, Italian jasmine or yellow jasmine, Zones 7b-9. Jasminum nudiflorum, winter jasmine, Zones 6-10. Jasminum officinale,, white jasmine, Zones 8-10. Jasminum polyanthum, pink jasmine, Zones 8-10. Jasminum primulinum (or mesnyi), primrose jasmine, Zones 8-10. Lonicera sempervirens, trumpet honeysuckle, Zones 6-9. 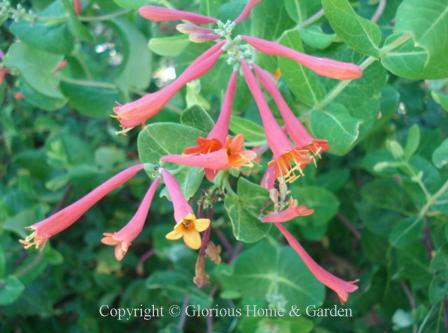 This is a charming semi-evergreen native vine with coral trumpet flowers that hummingbirds love. Lovely cultivars have been developed. 'Alabama Crimson' is shown below. Rosa banksiae, Lady Banks' rose, Zones 7-8. 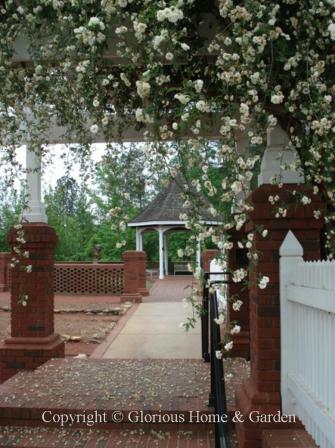 Not really a vine, of course, but a climbing rose with long arching thornless canes that behaves like a vine, meaning it is very vigorous and needs space or good support (as on the arbor at the State Botanical Garden in Athens, GA below). It is quite spectacular and charming in the spring when it is covered in small white or yellow flowers. 'Lutea' is the double yellow form. 'Alba Plena,' the double white form, is a little more fragrant that 'Lutea,' with a scent reminiscent of violets. Rosa laevigata, Cherokee rose, Zones 7-9. The Cherokee rose, the state flower of Georgia, is an evergreen rose with beautiful large, single white blooms in spring. Because of its thorns, it could be used effectively as an attractive, impenetrable hedge. Smilax smallii, bamboo vine or Jackson vine, Zones 7-9. 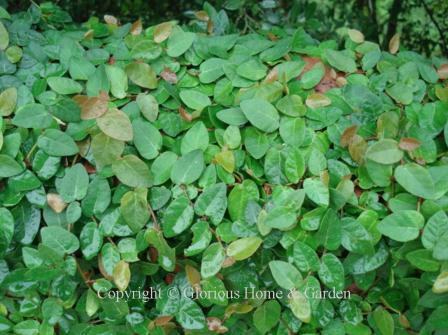 Unlike the awful common greenbrier, Smilax rotundifolia, with its sharp thorns and hard to eliminate nature, Smilax smallii is practically thornless and makes a handsome evergreen vine for a fence, trellis or arbor with its attractive dark green leaves. A southeastern U.S. native. 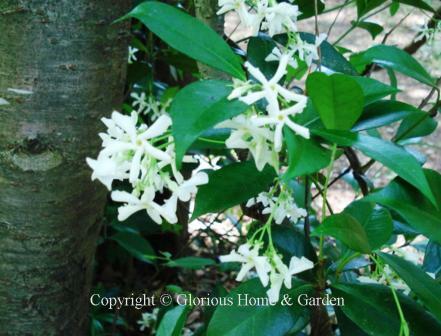 Trachelospermum jasminoides, star jasmine or Confederate jasmine, Zone 8-10. A very vigorous and enthusiastic evergreen vine that will soon wear out its welcome if not controlled, as it will reach out and engulf anything around--including chair legs, bird feeders and downspouts, as I learned from personal experience. 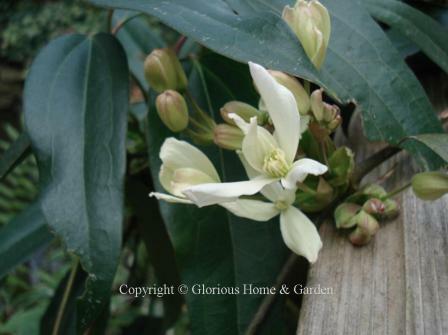 But that said, it is certainly worth growing for its deliciously fragrant white flowers in spring if given proper (and strong) support such as a pergola or trellis.